I still haven’t gotten my hands on actual basket-weaving reeds, canes, etc. BUT! 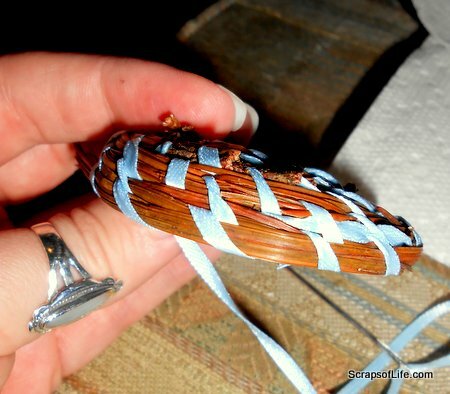 While I was searching for inspiration and instruction, I came upon this tutorial for a nifty pine needle basket, and that’s one supply I’ve got plenty of. We have a pine tree next to our driveway, on my side of the driveway, and one time when I went to get my oil changed the dude who popped the hood ended up having to carve away 3 months of pine needles (okay, okay, more like 5) that had scooted under the windshield-edge of the hood. Oops! No, I didn’t save those pine needles, but I did take a trip out into the yard before Todd got out the lawnmower and collected a bag of the longer pine needle boughs for this very purpose. I’ll leave it to the pro to explain all the fiddly details of the process (seriously, her pictures are fabulous, why reinvent the wheel?) and please note that this is intended to be a kid’s craft project, so there’s no excuse for you not trying it, too 😉 Here’s my abbreviated version. First you have to soak the needles, because by the time they’ve Â fallen down to earth they’ve gotten pretty brittle, then lay them out to dry a little, but not so much they become brittle and you have to start all over again. I pressed a bit of paper toweling over the tops to speed up the process a smidgen. Starting off the bottom center is probably the fiddliest part, but once you get the wrapping started it’s not so bad. 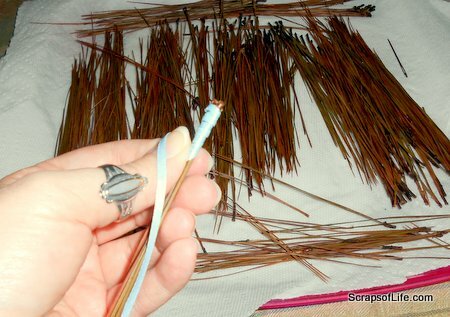 I used 5 pine needle bundles (opting to leave the needle caps on) at a time and it was a very workable amount. To start building up instead of out, start angling your pine needle bunches more on top of the previous row, rather than out to the side. If you want straight sides, place the needles on top of each other, but if you want a gently sloping side, go for more of a diagonal placement. You can start to draw the needle bands in tighter (diagonally to the inside edge) to create a narrow neck or a lip for keeping small bits in. I, however, ran out of ribbon so decided to leave mine as simply a saucer. A little bowl like this took maybe an hour, hour and a half tops, to construct (I was catching up on some DVR dramas and it was definitely less that 2 shows) and could work as a small change valet, or even a place to set your rings next to the sink. And (because I’ve got weddings on the brain–I bought my dress last week! 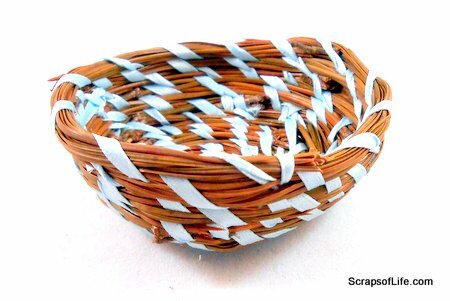 ), this little test basket would also be perfect as a ring-warming dish if a bride and groom were using that as part of their ceremony–it would be so easy to use ribbons to match the color scheme! 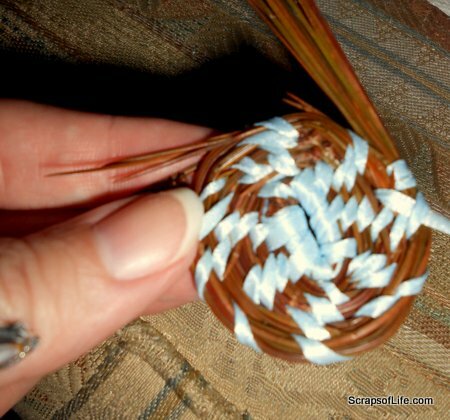 Okay, I have one more basket weaving project up my sleeve, if I can get the necessary supplies by this weekend. If not, we’ll come back to at some point and move on to our next art. 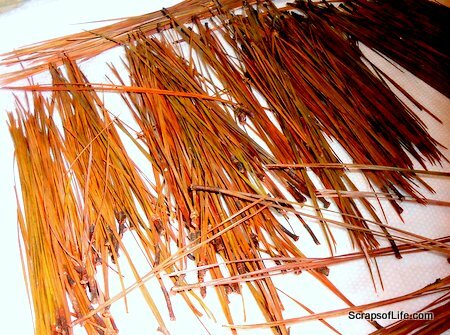 Anyone going to give pine needle baskets a go? I’d love to see your pictures if you do! I actually did a project like that once. It was not cute…. 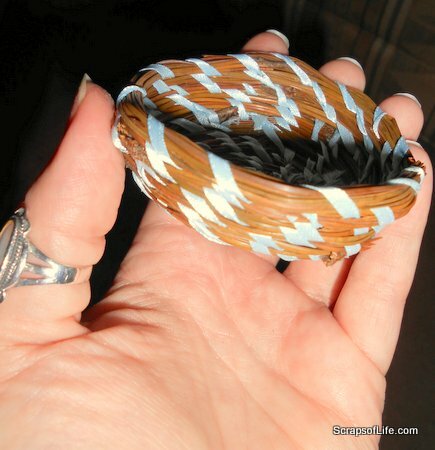 I love pine needle baskets and yours turned out beautifully! Love the way you improvised with the blue ribbon — a wonderful juxtaposition of rustic and refined. Thank you! It was fun to try, and I’m surprised at how flexible the finished basket is, now that it’s dry.